Home »Natural Gas Issues»Water and Gas Don’t Mix! A 1974 geological report estimates that aquifers in the San Luis Valley hold 2 billion acre feet of water, of which at least 140 million acre feet is potable (Pearl, 1974). At the (2001) going rate of $5000 to $12,000 per acre-foot in suburban areas, the value of this water on the market is over $700 billion to $1.6 trillion. At the (2008) going Safeway rate of $1.29 for a gallon of bottled water, this amount of water would be worth over $59 trillion. In other words: It is priceless! 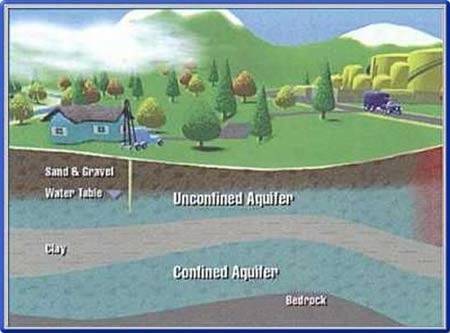 Today there are some wells in the unconfined aquifer and 6,000 wells in the confined aquifer. Water table today averages about 7 feet below the surface of the San Luis Valley. Surface soils are typically very sandy, highly porous, and permeable. Water table frequently rises to well above the soil surface level. Indeed, Valley old timers recall that in the early 1900’s, the only way to get from Moffat to Center, a distance of about 20 miles, was by boat! Locals also recall that during spring meltoff, the first two rows of the theater in downtown Saguache would typically be under water. Hence, any additions of contaminants at the surface by either exploratory or production gas wells would inevitably poison towns, residential areas, agricultural fields, and critical, riparian wildlife habitats in the San Luis Valley and the BNWR! 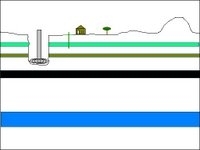 Figure 2 shows a schematic diagram of confined and unconfined aquifers. 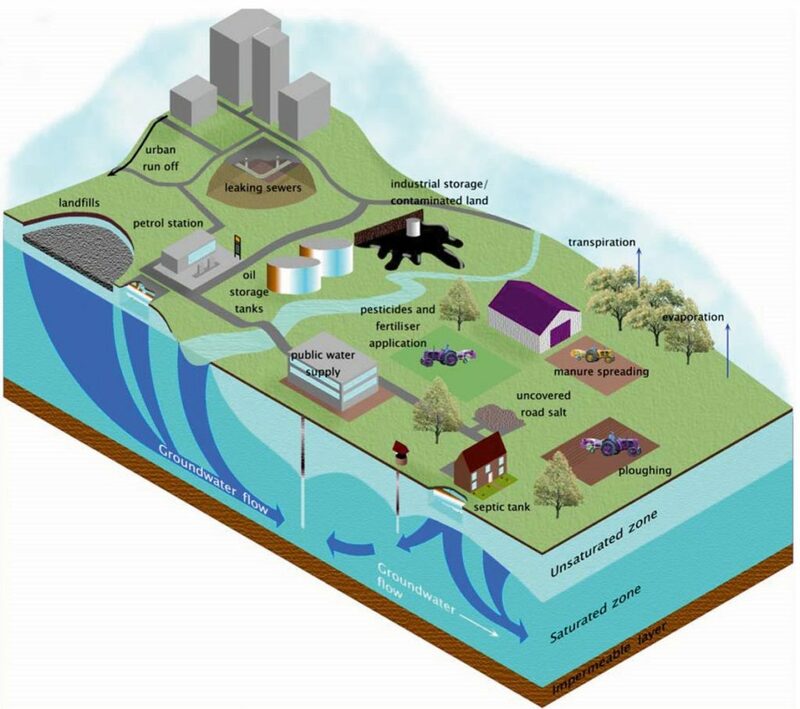 According to the water encyclopedia (www.waterencyclopedia.com/Oc-Po/Pollution-of-Groundwater-Vulnerability.html), , the sensitivity of an aquifer to contamination depends on its physical characteristics. A highly sensitive aquifer has little or no defense against infiltrating contamination. The most sensitive and vulnerable aquifers are those that; 1) are shallow, 2) are comprised of unconsolidated sands and gavels, and 3) are overlain by porous sandy sediments and soils. In addition, aquifers in 4) fractured or faulted materials are also very sensitive because they recharge very rapidly. Thus, it is clear that the San Luis Valley aquifers have all of the characteristics of ” highly sensitive” and vulnerable aquifers. It is imperative, then, that the BNWR conduct a”vulnerability assessment” of the aquifers before allowing any gas drilling in this extremely sensitive environment. Because of its low population and lack of industrial activities, water quality in the San Luis Valley is generally excellent. Two exceptions to this are: 1) in the northern part of the valley where overuse of irrigation water has caused accumulation of salts and alkali at the surface and in the unconfined aquifer, and 2) between Alamosa and Moffat (on the east side of Highway 17) where wells from the confined aquifer often contain between 10 and 20mg/l methane gas. (10 mg/l is considered “ignitable” whereas 20 mg/l is completely saturated with methane). Gas and oil operations contaminate groundwater in many ways. 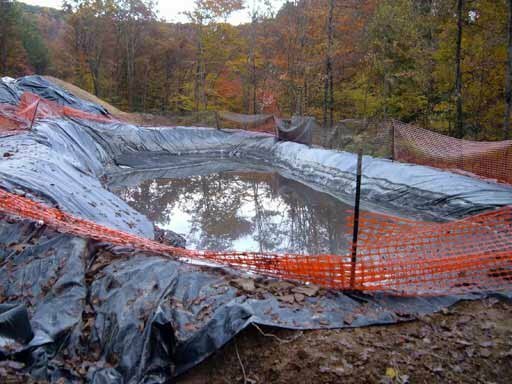 In large scale gas production, serious pollution can come from both the surface (from evaporation ponds, drilling pits, condensate, leachate, etc.) 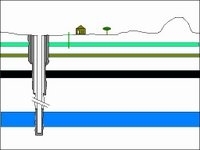 and from the subsurface (from mixing of water with drilling fluids and cuttings, and oil and gas). Figures 1, 2, and 3 show typical sources of groundwater pollution that come from the surface. First, gas and oil are hydrocarbons. Hydrocarbons evaporate easily, dissolve to some extent in water, and are often toxic. One component, benzene is carcinogenic. Because hydrocarbons are less dense than water, they rapidly move upward through aquifers. And hence, where wells in the San Luis Valley penetrate the “blue clay,” gas and oil can leak upward from the confined aquifer into the unconfined (surface) aquifer. Recall that one quart of oil can contaminate 250,000 gallons of water. And where concentrations of methane gas are above about 10 mg/l, the water is ignitable and highly polluted. 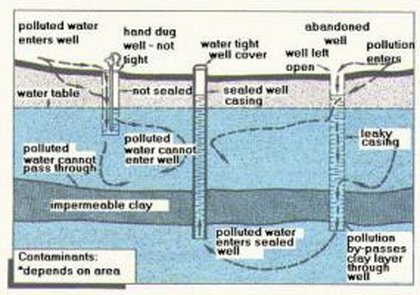 In addition, since concrete casing of wells typically deteriorates after about 20 years, old wells can be an important source of pollution (Figure 5). 4) After the driller finishes the initial hole and until he completes the concrete and steel casing of that hole, the good water can mix freely with bad water, compressed air, cuttings, drilling fluids, etc. (Figure 10). 5) If the driller does a bad job of pouring, there can be holes or voids in the concrete casing. 6) Or if he doesn’t wait the required 8 hours (a frequent occurrence), the concrete may not set up properly, and cracks and spaces can form in the concrete, creating passages through which bad water (or hydrocarbons) can migrate upward and polluted water can migrate downwards. 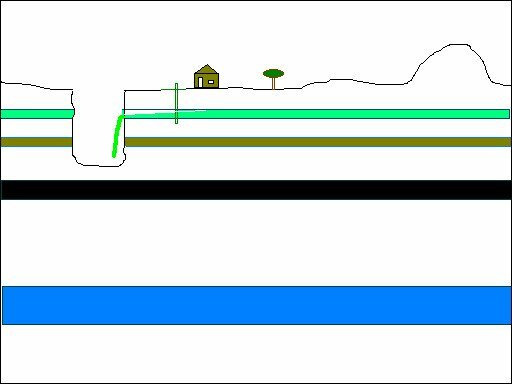 7) When the hole is extended the hole thousands of feet downward to or through the coal beds into gas-bearing strata (Figure 11), the driller lines the well hole with concrete casing at the top and bottom levels only, leaving no casing in the middle portion. 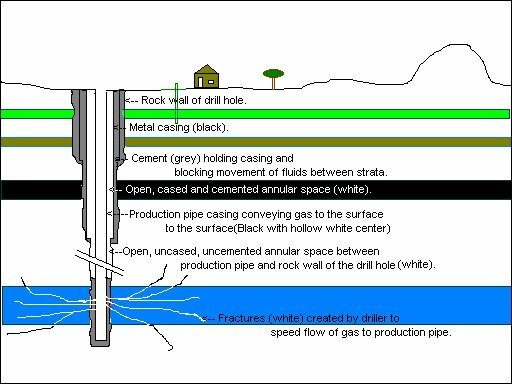 8) Once the hole is drilled into the gas-bearing strata, the driller sets off explosives in the gas-bearing strata to get the gas moving. 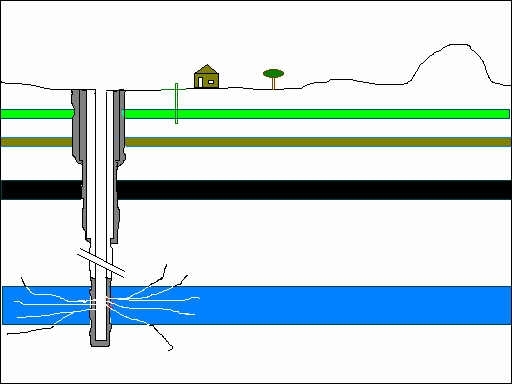 9) To increase the flow of gas further, the driller then pumps compressed air, water, or nitrogen down the hole to cause fracturing of the gas-bearing rock in a process called “hydraulic fracturing.” To make these cracks at these depths, enough pressure has to be exerted to actually lift all the overlying rocks (Figure 12)! Typically, hydraulic fracturing (“fracking”) involves high-pressure injection of fluids and sand to fracture rock formations and prop the fractures open with sand in order to allow more gas to flow to the well. After fracturing, some of the chemicals used in the “fracking” process remain stranded underground. “Fracking” fluids may include hazardous chemicals such as biocides, diesel fuel, acids, metals, ethylene glycol, corrosion inhibitors and other chemicals. The mobility of these substances in the ground, or their ability to contaminate ground water and aquifers has not been evaluated.” Although “fracking” normally occurs just after a well has been drilled, a well may be re-fractured as many as 28 times after a well goes into production. Dr. Theo Colborn of TDEX states “Fracturing of wells is a common practice…, in which a million gallons of fluid are injected underground, creating a mini-earthquake that facilitates the release of natural gas. The gas industry claims that 70% of the material it injects underground is recovered. While the fate of the remaining 30% is unknown, the recovered product is placed in holding pits at the surface and allowed to evaporate. This results in many highly toxic chemicals being introduced into the air as well as being dispersed into local surface waters. At some locations because of regional differences in geology or technology, 100% of the injected material may remain underground. The condensed residues remaining in the pits are taken off-site and dealt with in two ways: 1) they can be re-injected into the ground, posing concerns for aquifers, or 2) they can be “land farmed”by which they are incorporated into the soil through tilling. Land farming can release toxic chemicals to the air via volitile substances and dust, or result in accumulations of mixtures of toxic metals in the soil. Although gas industry spokesmen typically claim they “only use water, soap and guar gum,” analysis of chemicals from spill accidents by chemist, Dr. Theo Colborn, reveals that the chemicals are highly toxic and destructive to human health. In particular, the chemicals harm 1) skin, eyes, and sensory organs, 2) respiratory systems, 3) stomach and liver, and 4) the nervous system. Of the 245 chemicals Dr. Colborn analyzed, 91% were found to have adverse health effects and 35% of the products were found to have endocrine disrupting effects. Informative websites on contamination of groundwater by gas mining processes include those of The Endocrine Disruption Exchange (TEDX by Dr. Theo Colborn) (www.endocrinedisruption.org), Earthworks(www.earthworksaction.org/oilandgas.cfm), and the Western Colorado Congress (www.wccongress.org). Thus, in gas drilling and mining processes, good, clean, potable water is used for drilling, contaminants are added to both surface and groundwater, and contaminated groundwater is added to the surface as evaporation ponds, etc. There is also typically aflowback of “produced water,” condensate. and “fracking fluids” that contaminate water, soils and air. Gas production in Garfield County, Colorado, for instance has resulted in degradation and ruination of many water wells. Both water quality and quantity are adversely affected. In La Plata County, Colorado, numerous houses have caught on fire due to buildup of methane gas in the houses themselves. Mining of coal-bed methane gas, involves pumping vast quantities of often extremely saline “produced water” to the surface and is particularly polluting. Produced water is rich in oil, sulfur and phenol and can be smelled and tasted. It is definitely poisonous and unfit for human, wildlife, or agricultural use. Pumping CBM gas out of the ground produces large volumes of water, which often contain large amounts of dissolved solids (e.g., chlorides, nitrates, nitrites, sodi-arsenic, barium, boron, cadmium, chromium, copper, lead, lithium, mercury, nickel, silver, and zinc), hydrocarbons (benzene, ethylbenzene, napthealene, toluene, phenanthrene, bromodichloromethane, and pentachlorophenol) and radionuclides (uranium, radon, and radium). Of these, benzene is a known human carcinogen. In addition, produced water is often highly saline, ranging from about 1,000 to over 400,000 mg/l. The EPA’s recommended safe drinking water limit is 500 mg/l. Waters with above 5,000 mg/l salts are considered too saline for almost all crops. If produced water is discharged onto land surfaces, then, salts can render agricultural land unusable (OGAP, 2005). Massive de-watering of aquifers may also lead to increased methane and/or hydrogen sulfide (H2S) migration to the surface. Escape of methane and H2S can also result from inadequate well control procedures and faulty casing or plugging of wells. The gas can then collect in explosive levels in homes and other structures. Thus, methane and H2S seepage/venting can be one of the most disastrous problems facing landowners living near these CBM operations. But Can We Prove that the Drilling Will Contaminate the Aquifer? At the February 12, 2008 public hearing on the Draft EA, William Berg, petroleum geologist and principle author or the Draft EA, “defied” me and other concerned citizens to prove that the proposed gas drilling would pollute the aquifers in the San Luis Valley. Of course, it is not possible to prove a future occurrence (or a negative, for that matter). However, gas drilling operations around the country and the world are characterized by many, many “accidents” that contaminate water, air and land. Peggy Utesch, of the Grand Valley Citizen’s Alliance in Garfield County, Colorado, stated: “We know that everyday there are accidents and incidents in the field- just look at the (COGCC) commission’s reports.”Indeed, the Denver Post conducted a study that showed that while most Colorado operators are passing inspections, 20 companies have violation rates that exceed 50 percent (DenverPost.com 3/7/06). Nancy and Gary Gagne, who have a ranch south of Silt, claim they caught Encana filling in a waste pit on their property without first pumping out the liquids. But a commissioner inspector told the couple he would not sanction the company. Jacobsen stated: “I tell people it doesn’t matter if you catch a company red-handed doing something they shouldn’t. Billy Jack ain’t coming to help.” Thus, perhaps the best way to “prove” that gas drilling operations in the San Luis Valley would contaminate our aquifers is simply to examine the record of “accidents” documented elsewhere. b) Rick Arbaney’s (5643 CR 33, Silt, CO) well tested positive for thermagoenic methane and hydrocarbons. He also lost about 1/3 of his goat herd and many new-borns in spring of 2004. CSU determined that the goats died of bacterial pneumoneia, which may be related to methane leaking on proverty from the Divide Creek gas seep. c) Tom and Sandy Lloyd (5500 CR 331, Silt, CO). High methane levels in their water well. d) Michael and Stephanie Dietrich (6544CR 331,Silt, CO). EnCana bought their ranch. Their well was filled with biogenic and thermogenic methane. e) Robert and Wilma Beurger (78 and 83 years old) (7348 CCR 331, Silt, CO). 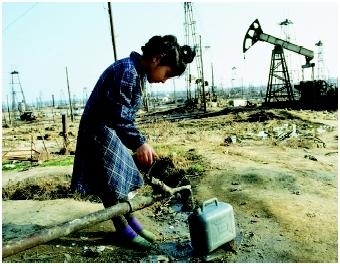 Their spring is polluted, probably due to leakage from EnCana’s nearby gas pipeline. f) Harold and Linda Smith (0546 CR 326, Silt, CO) Natural gas drilling mud found in their 260′ well. g) Michael and Kenda Spauling (1601 CR 313 New Castle, CO, High levels of methane in their well. h) Marty Miller (6338 and 7121 CR 311) High levels of methane in two wells. i) Hermann Stauffer (9109 CR 311, Silt, CO). His extremely productive natural spring has dried up. Problem started when EnCana drilled the Morgan well. j) Pepi and Ann Langegger (7863 CR 311, Silt, CO) Stock pond and Divide Creek have high levels of methane. Three houses on the ranch are on whole house replacement water systems. k) Wendall and Kalin Goad (4120 CR 320, Rifle, CO). Gas traveled along a mile long fracture and accumulated in the Goad well. The well exploded. They continue to have difficulties. l) Jerry and Lori Godat, 9818 CR 331, Silt. When EnCana drilled Well Pad E-27, there well went completely dry. m) Lou and Sandi Vallario. Their water well is close to the Arbaney natural gas pad. Methane content of their water has gone from 2-3 mg/l to 7.1 mg/l. n) Kelly Couey (4745 and 5000 CR 315, Silt. A fresh water spring that has served their family for multiple generations has been rendered undrinkable by natural gas drilling. o) Rhonda Naugle (16605 US Highway 6 and 24 Rifle). Garfield Co. word of mouth says her cousin was paid half a million dollars after his kids were sickened by close proximity to a waste pit in the Rulison area. Non-disclosure agreements were signed so no newspaper story. 2) Hydraulic fracturing fluids are the prime suspect in incidences of impaired or polluted drinking water in Alabama, Colorado, New Mexico, Virginia, West Virginia, and Wyoming. The Environmental Protection Agency (EPA) does not regulate the injection of fracturing fluids under the Safe Drinking Water Act. Thus, “the oil and gas industry is the only industry in America allowed by the EPA to inject known hazardous materials-unchecked- directly into or adjacent to underground drinking water supplies.” The 2004 EPA study exempting hydraulic fracturing fluids from regulation has been called “scientifically unsound” by EPA whisteblower Weston Wilson. (http://earthworksaction.org/Hydfracking.cfm). 3) To exacerbate the problem, as oil and gas exploration and production have boomed in Colorado, the business of inspecting wells has busted. Colorado has only eight inspectors- one for every 3,625 wells. Today, wells are inspected an average of once every 3.5 years. A West Virginia land owner, Jack Wyscaver, compiled a long list of complaints against an operator drilling on his ranch. Only after the commission’s environmental specialist visited the property, was a notice of violation issued against the company. “It just goes to show that if the public doesn’t complain, nothing will ever get done.” (DenverPost.com, 3/7/06). 5) Finally, natural gas is also the most important source of indoor air pollution and is responsible for generating more illness than other kind of indoor pollutants. (http://www.geocities.com/Rainforest/6847/). Thus, we at Water Watch Alliance agree with the “Position Statement on Oil and Gas Drilling in Sante Fe County” (http://nmwaterinfo.org/html/position.html). The Valle Vidal was saved, New Mexican Governor Richardson has put a 6-month moratorium on gas drilling in the Galisteo Basin, and Colorado Governor Ritter has told the Moffat County Commissioners not to allow gas drilling in the Vermillion Basin. So Why Not the San Luis Valley and its Aquifer? Colborn, T., Dumanoski, D., and Myers, J.P., 1997, Our Stolen Future: Are We Threatening Our Fertility, Intelligence, and Survival?- A Scientific Detective Story, A Plume Book, NY, 316 pp. Pearl, Richard, H., 1974, Geology of Ground Water Resources in Colorado. Denver: Colorado Geological Survey, Department of Natural Resources. 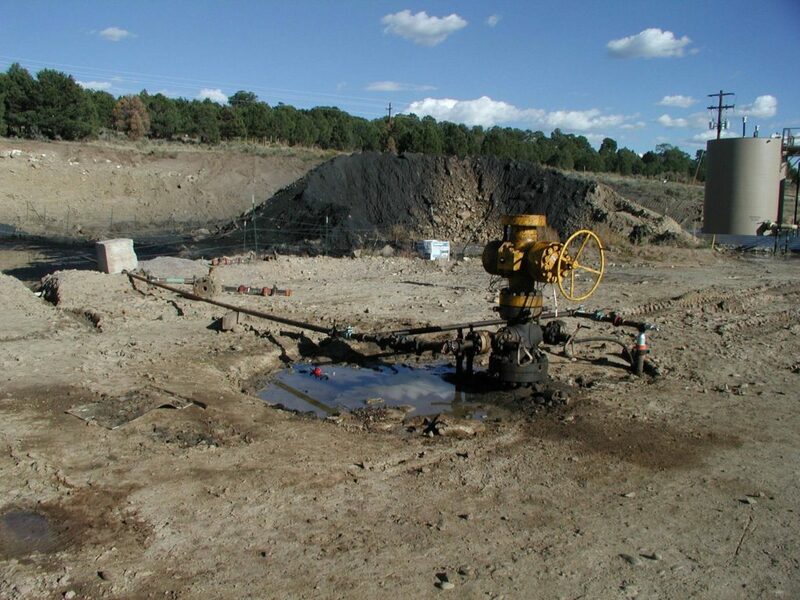 ← Previous Previous post: CBM: Coal-Bed Methane Gas?